ICV Produces the Medical Home Summit Webcast in Washington DC ICV provides webcasting services in Washington DC for multiple clients. Last month we produced 3 live webcasts at the Grand Hyatt Hotel in Washington DC for Global HealthCare LLC. 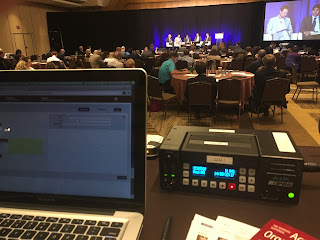 The Medical Home Summit Live Webcast included live webcasting production in 4 breakout rooms and 1 General sSession over 3 days. ICV staff updates and manages the Webcasting Media Portal which serves as an online library for the past years events as well as the live event destination for the live webcast. ICV produces live streaming webcast in Anchorage Alaska Crews hopped up to Anchorage Alaska for our client HCPro to produce another in a series of healthcare leadership training webcasts. Hosted by Southcentral Foundation, the day long webcast was streamed to a wide audience that had paid to take part in the deep-dive presentation to hear from leaders at Southcentral Foundation about how they created a unique healthcare system with a 93 percent customer-owner satisfaction. Live Streaming these type of leadership and learning discussions proves to be a very cost-effective way for practitioners, administrators and professionals to learn from the most successful leaders in healthcare. HCPro has an ongoing series of these valuable courses whcih ICV produces around the country.